Cinnamon candies give this easy Red Hot Fudge a spicy yet creamy flavor. 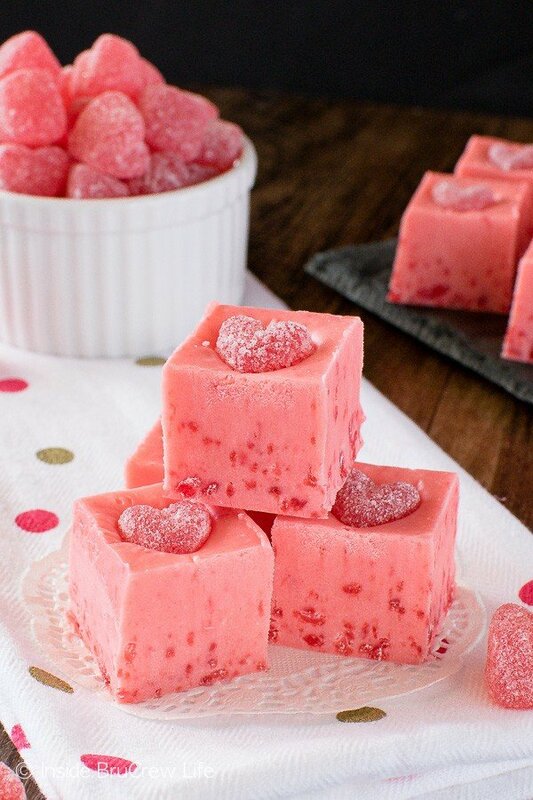 It’s the perfect treat for Valentine’s day parties! What is it about holiday candies and treats that get me every.single.time? Every holiday I make a pact with myself that I am not going to go nuts buying different candies or cookies because I never use them all. And then what do I do? Go into the store for milk and eggs and the holiday goodies just start jumping into the cart. Seriously! I don’t even remember grabbing half of them. It’s a real problem. The idea for this red hot fudge has been rolling around in my head for a few months. I had planned on making it at Christmas when fudge is more popular. But I think fudge should be consumed year round, so I was ok putting it off a little long. I even bought the red hot candies months ago. But it wasn’t until I wandered through Target mindlessly grabbing all the pink and red candies that I decided it was time to make the fudge. 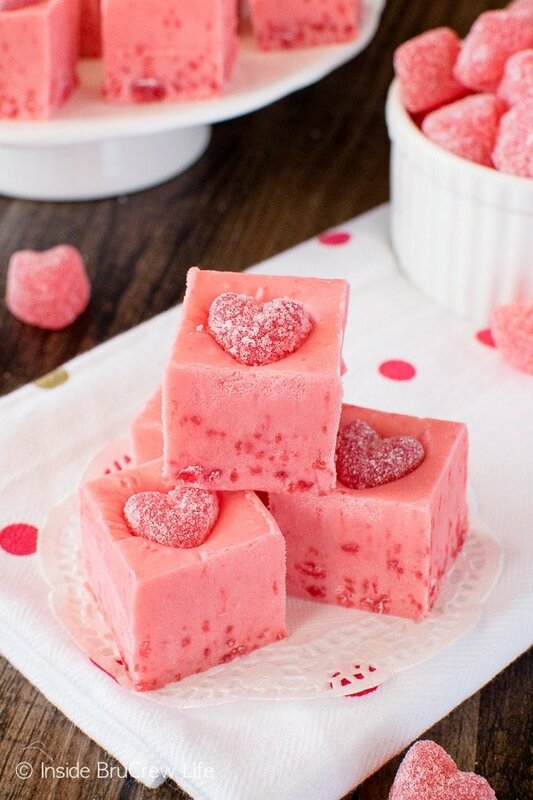 You see I found red cinnamon lips and cinnamon jelly hearts and I thought they would be so fun on top of the fudge. Although the cinnamon lips turned out to be a little too big, so I will have to step up and eat that bag of candy. My skinny jeans just cringed at that plan. Maybe I should find someone to share them with. 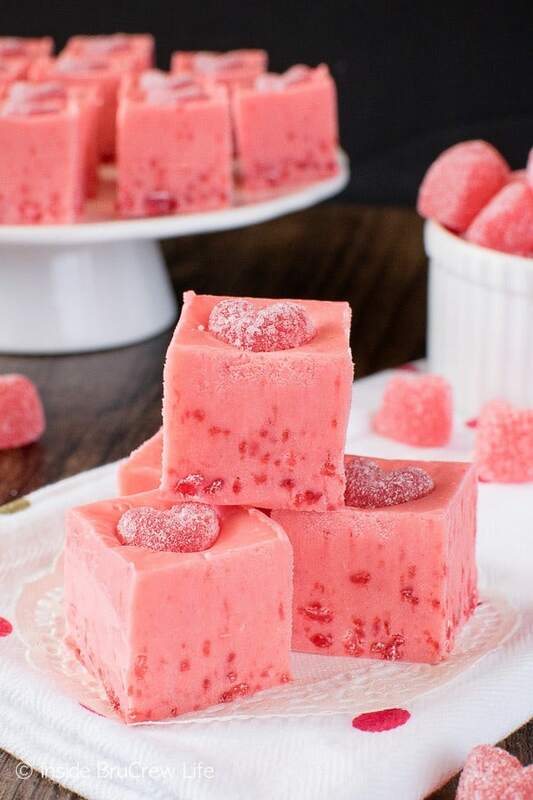 Let’s talk about this glorious pink fudge for a minute. I just can’t get over the color of it. It is so bright and vibrant and pink! A few years ago I made this red hot Oreo fudge. I remember that fudge being so good. A little bit of cinnamon and a little bit of chocolate worked so well together. This time I decided to forget the chocolate (I know, I know. Who am I?) and amp up the red hot flavor even more. Word of warning…do not crush red hots in a plastic ziplock with a wooden spoon. Those little red candies have super strength! And sharp edges when they do break. Take it from me, you will end up with red hot dust everywhere. This time I was smarter. I dumped the candies into a food processor and pulsed until they became a mix of dust and candy bits. Adding that candy is what gives your fudge its vibrant color and taste! I have declared this red hot fudge to be my “new favorite”. Stay tuned though because that tends to change regularly. Cinnamon candies give this easy Red Hot Fudge a spicy yet creamy flavor. 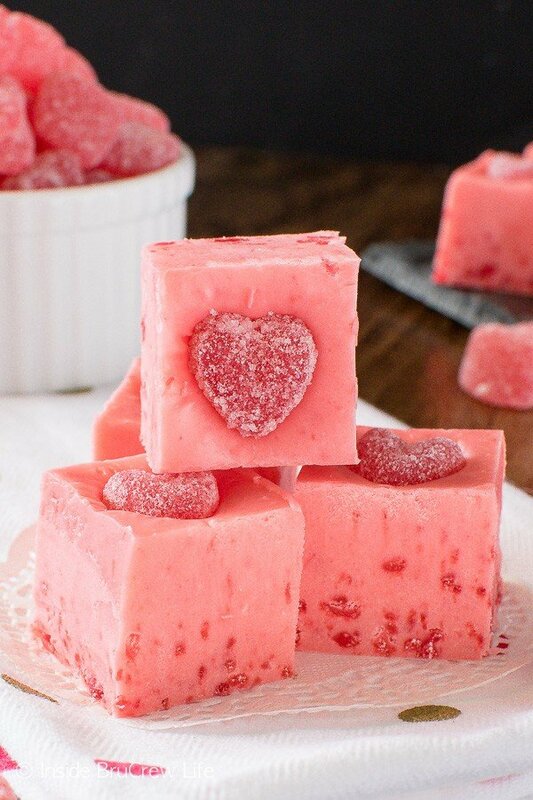 It's the perfect treat for Valentine's day parties! Place the chocolate chips and sweetened condensed milk in a large saucepan over low-medium heat. Stir until melted and creamy. Add the marshmallow cream and red hots and stir until everything is melted again and the fudge has turned reddish pink. Pour the fudge in the prepared pan. 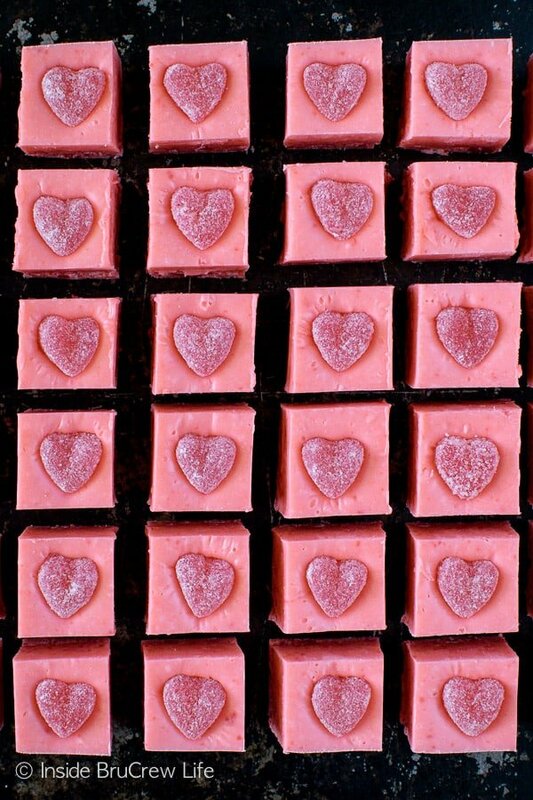 Let cool for 10-15 minutes, then place the cinnamon hearts on top of the fudge in a grid. Let set until completely cooled and hardened. Cut into 36 squares. Store in a tightly sealed container. How perfect for Valentine’s Day! 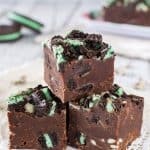 I have always loved red hots, and I’m sure putting them into fudge only makes them better. Can’t wait to give this a try! 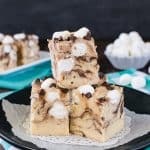 I think I will need to make this. I adore the red hot flavor. Thanks for tip on crushing red hots. How long do you continue cooking after adding the red hots and marshmallow cream? 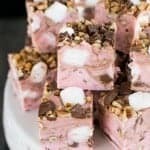 You don’t keep cooking it after adding the candy and marshmallow. It is already hot enough to melt both of them. Just keep stirring it until the mixture is creamy and bright red. I hope you like it! Thank you, gonna try it this weekend ? My best friend loves red hot candy! 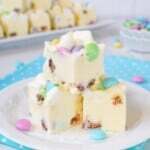 I might make this fudge for her. 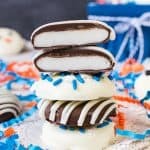 Honestly, I am not good at making candy, but this recipe is rather easy to make. I made it yesterday and it tasted so good. I will make it again on Valentine day for my boyfriend. I am sure he will love it. Thank you so much! oh god, I love cinnamon flavor!!! I will note and cook it right tomorrow, have a sweet valentine Jocelyn!! 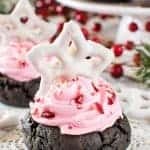 Only 10 minutes for these delicious Red Hot Fudge? I will definitely make it for my husband. He will have a hot Valentines day. Thank you for your great recipe.